The Sony Cyber-shot DSC-RX100 V is the fifth generation of Sony's popular premium compact camera, introducing a number of improvements that focus on speed. At the heart of the RX100 V is a newly developed 20.1 megapixel 1.0-type stacked Exmor RS CMOS sensor with a DRAM chip, which allows it to continuously shoot at 24fps at full resolution with AF/AE tracking for up to 150 JPEGs, the world’s fastest for a compact camera. In addition, the RX100 V is is equipped with a Fast Hybrid AF system boasting an AF acquisition time of 0.05 seconds and 315 AF points covering approximately 65% of the frame, and an Anti-Distortion electronic shutter which enables completely silent shooting as well as the ability to shoot at shutter speeds as fast as 1/32000 second. The Sony Cyber-shot DSC-RX100 V also features a 24-70mm Carl Zeiss Vario-Sonnar T* zoom lens with a fast aperture of f/1.8 at the wide-angle setting and f/2.8 at full telephoto, Optical SteadyShot image stabilization, a retractable 2.35 million dot XGA OLED electronic viewfinder, 4K video recording with full pixel readout and no pixel binning, super slow-motion recording at up to 1000fps, the latest-generation BIONZ X processing engine, wi-fi and NFC connectivity, a 180-degree tilting 3-inch LCD screen, built-in pop-up flash, support for the Raw format, a built-in 3-stop (1/8) Neutral Density filter and full manual controls. 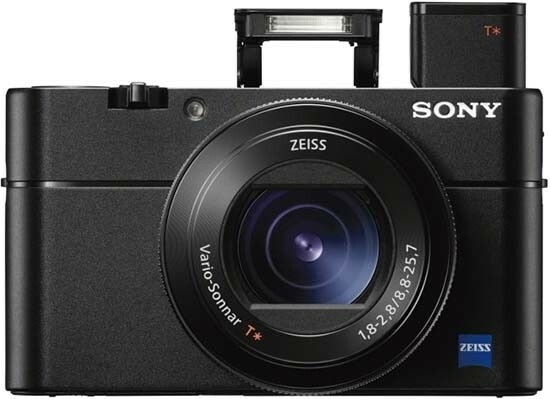 The Sony Cyber-shot RX100 V is available for around $1000 /£1000 / €1200. The Sony Cyber-shot DSC-RX100 V offers a relatively large 13.2 x 8.8mm CMOS sensor, which is the same size as that used in the Nikon 1 series compact system cameras and 4x as big as a typical compact sensor, a fast lens at both ends of the 24-70mm zoom range, a large and high-resolution screen that can be flipped forwards through 180 degrees, speedy auto-focusing system plus manual focusing too (complete with focus peaking), full control over exposure and Raw file format support. The Sony DSC-RX100 V's lens has fast maximum apertures of f/1.8 at the 28mm wide-angle setting and f/2.8 at the 70mm full telephoto setting. The combination of this fast lens with a seven-bladed circular aperture and the big sensor is a real joy to use, allowing you to easily create defocused depth-of-field effects that you simply can't achieve with most other pocket cameras. If you've been searching for a small camera that will give you DSLR-like bokeh, then look no further than the RX100 V. The combination of the fast maximum apertures, effective built-in image stabilizer and maximum ISO speed of 12800 also makes this camera well suited to hand-held low-light photography, while the ND filter and top shutter speed of 1/32000 makes it easy to shoot in bright sunlight and still use f/1.8 or f/2.8 to effectively blur the background. The RX100 V has a new high speed Anti-Distortion Shutter with a maximum speed of 1/32000 second that minimises the 'rolling shutter' effect commonly experienced with video footage of fast moving subjects. It also enables the user to work with wide open apertures at brightness levels up to EV19, as well as being completely silent for more candid moments. Surrounding the lens is an innovative control ring, much like the one first seen on the Canon PowerShot S-series cameras. Depending on which shooting mode is currently selected, this allows you to change key settings including aperture, shutter speed, the digital zoom and picture effects. The rear control ring also achieves the same things, but we found it more intuitive and quicker to use the large, smooth front ring. It's not original, but is very effective. 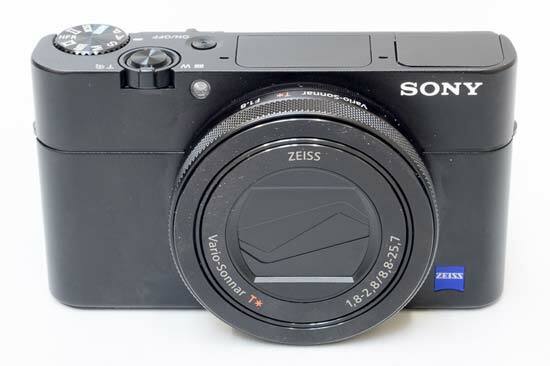 Despite its large image sensor and correspondingly physically big zoom lens that dominates the front of the camera, plus the inclusion of a tilting screen, and built-in viewfinder and flash, the Sony RX100 V is still quite small and slender, measuring just 4.1cms in depth, 5.8cms in height and 10cms in width, and weighing 299g with the battery and memory card fitted. On the back there's a large 3-inch, 1228k-dot resolution LCD screen which can be tilted up to 45° downwards to shoot over crowds or up to 180° upwards for easier selfies. Remarkably, the RX100 V also has an electronic viewfinder to fall back on in brighter lighting conditions, which has been cleverly integrated into the camera so that it's hidden away when not is use. Activated by a switch on the side of the camera, the EVF pops up out of the camera body, then needs to be pulled backwards to function properly. The EVF is an 0.39-type OLED panel with 1,440,000 dots and magnification of 0.59x, which in practice proved more than good enough to use for long periods of time in preference to the LCD screen. There's even an eye-sensor onboard for automatic switching between the LCD screen and EVF. Press the small On/Off button on the top plate and the Sony Cyber-shot DSC-RX100 V quickly readies itself for action in a just over a second. The adequately sized shutter-release button has a definite halfway point, very quickly determining focus and exposure with a bleep of affirmation even in low-light, focus points highlighted as green rectangles on the LCD. When you manually focus, MF Assist automatically magnifies the image to help you get sharp result, and there's also the same convenient Peaking function from Sony's DSLRs that highlights sharply-focused areas of the image on the LCD screen. Go on to take the shot and JPEG or Raw images are quickly committed to memory in a single second, the screen momentarily blanking out and then displaying the captured image before the user can go on to take a second shot. 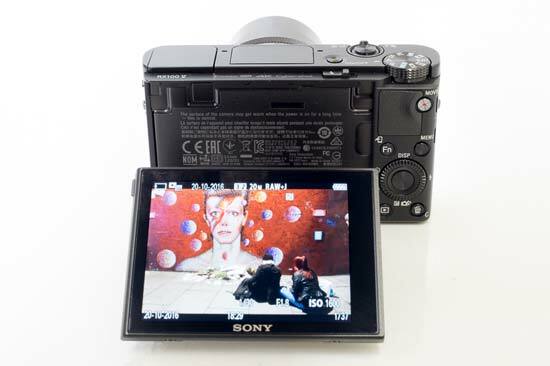 The Sony Cyber-shot DSC-RX100 V is wi-fi capable and the functions can be adjusted in the Settings main menu. You can use WPS Push to force locate a hot spot, access settings, edit the device name, display the MAC address or format all settings if you wish. More “on the spot” wi-fi functionality is done in the quick menu. Choosing where to transmit the images to (either smartphone or computer) is done in the Playback menu when you're looking at the pictures you've taken. One cool feature of the wi-fi is being able to link the camera to your smart phone using the PlayMemories Mobile app. You can then use the phone as a remote so those outstretched arm 'selfies' will be a thing of the past. The RX100 V also features NFC (Near Field Communication) technology (the same technology that's used for mobile payments), which allows you to connect it to a compatible internet enabled device or another NFC-enabled camera by simply tapping them together. Additionally, the RX100 V can now connect to a smartphone using a QR code for faster access. The shutter release button is encircled by a responsive forefinger-operated push/pull rocker zoom lever, with the camera taking around four seconds to zoom from wide-angle to full telephoto. Sony have added a clever step zoom function which lets you instantly choose from five popular focal lengths using the control ring - 24mm, 28mm, 35mm, 50mm or 70mm . The RX100 V's twin built-in stereo microphones are also located on top of the camera, plus a round shooting mode dial with a knurled edge and positive action. This lets you quickly switch between the various shooting modes that are on offer. Sony has included Intelligent Auto scene recognition, which works in virtually identical fashion to the intelligent auto modes of Panasonic's and Canon's compact ranges. Simply point the RX100 V at a scene or subject and the camera analyses it and automatically chooses one of 11 pre-optimised settings to best suit. There's also the Superior Auto mode, which places greater emphasis on reducing blur and noise and increasing the dynamic range. 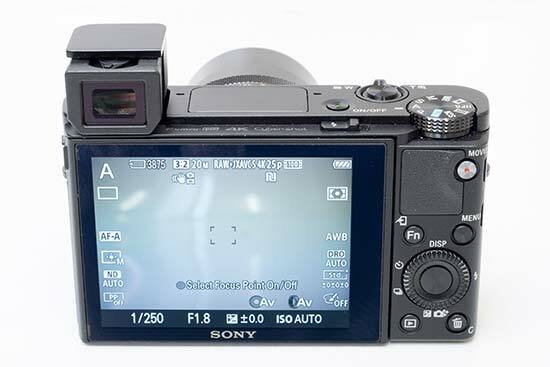 Adding to the RX100 V's snapshot simplicity, these features accompany face recognition and smile shutter functionality, the former mode biasing human faces in the frame and the latter mode firing the shutter when it detects a smiling subject. The Face Detection system automatically adjusts the focus, exposure and white balance for people in the frame, and can even be set to distinguish between children and adults. Smile Detection offers three self-explanatory options, Big, Normal and Slight. Used in conjunction, the Face and Smile Detection systems do result in more hits than misses, especially in contrasty lighting conditions. The self-portrait options in the self-timer menu work by automatically taking the shot with a two second delay after either one or two people have entered the frame. In addition to the regular Program mode, which provides the full range of camera options and additionally allows you to change settings like the ISO speed and metering, is the welcome inclusion of Aperture-priority, Shutter-priority and fully Manual modes which let you independently set the aperture and shutter speed, making the RX100 V instantly appeal to the more experienced photographer. The range of apertures on offer is extensive for a compact camera, ranging from F1.8-F11, and the ability to choose from 30 - 1/32000th second shutter speeds opens up a lot of creative potential. There's also very welcome support for the RAW file format, which is really the icing on the cake for serious photographers looking for a backup-pocket camera to their DSLR. The proven Sweep Panorama mode lets you capture a panoramic image very easily without the use of a tripod. All you need to decide is whether you would like to start from left or right, top or bottom. Then press and hold down the shutter release while doing a "sweep" with the camera in hand. Exposure compensation is available before you start the sweep, but the exposure is fixed once you depress the shutter button. After you are done with the sweeping, the camera does all the processing required, and presents you with a finished panoramic image. There are two modes, Standard and Wide. Note that if you do the sweeping too slowly, or you let go of the shutter release button too early, the panorama will be truncated. In the Hand-held Twilight and Anti Motion Blur shooting modes, the DSC-RX100 V takes six shots in a rapid sequence, typically at a high sensitivity setting and a (relatively) fast shutter speed, and then combines them into a single image that has somewhat less noise than a single shot taken at the same ISO and exposure settings. In our experience, the difference between the two modes is that in Anti Motion Blur mode, the camera is more willing to pick a really high ISO setting like ISO 1600 to maintain a fast shutter speed, whereas in Hand-held Twilight mode, it will only go as high as absolutely necessary to avoid camera shake at the chosen focal length. If light levels are truly low, however, the RX100 V will pick a high ISO speed even in this mode. The Clear Zoom function effectively digitally doubles the zoom range, using Sony's Pixel Super Resolution Technology to increase the magnification. The Auto Portrait Framing mode uses face detection and the rule of thirds to automatically crop and create tightly framed portrait shots. The same Pixel Super Resolution Technology ensures that the resulting image is still a full 20 megapixels in size, and the original uncropped image is also saved for easy comparison. Sony's long-standing D-Range Optimizer and HDR functions are present to help even out tricky exposures, for example where a bright background would normally throw the foreground into deep shadow. You can see from the examples on the Image Quality page that these features produce a photo with noticeably more dynamic range than one taken using one of the standard shooting modes, but at the same time without replicating the often "false" look of many HDR programs, and both offer a wide degree of customisation. Sony has gone to great lengths to enhance the RX100 V’s video abilities, as not only can it record at Ultra HD 3840 x 2160 resolution at 30fps for up to 5 minutes, but the power of the Bionz X processor can also be harnessed to record slow motion, high frame rate Full HD 1920x1080 sequences at up to 960fps and 8 seconds in duration via the dedicated HFR shooting mode. The RX100 V utilises 5028x2828 pixel to create the UHD video so that it effectively oversamples by 1.3x in each dimension, which should result in better quality footage. The movie-making potential is further enhanced by 100Mb/s high-bit-rate XAVC S data encoding, as well as clean 4:2:2 uncompressed video output over HDMI for use with an external recorder, and the Fast Hybrid AF system is available during movie shooting for ensuring accurate, fast tracking using all of the 315 phase-detection AF points. Finally, the RX100 V features Sony’s S-Log 2 gamma curve which enables it to record greater dynamic range, providing you’re prepared to colour grade the recording in post-production, and you can also save an 8.29 megapixel still from the UHD 4K movies. The rear of the DSC-RX100 V is dominated by the large 3 inch LCD screen, with the resolution a pleasingly high 1228k dots. As already mentioned, the screen can now be usefully tilted up and down. To the right of the screen is the one-touch movie record button next to the rubberised thumb-rest. Underneath is the Function button, which accesses up to 12 customisable options that appear on the LCD screen as two rows of icons that can be selected using either the lens or rear control rings. The Function menu proves to be a very handy way to quickly change the RX100 V's key settings and one of the main ways of setting the camera to suit your shooting style. Alongside the Function control is the Menu button - press this and a number of shooting and set up folders appear on screen, with white text on a black background aiding visibility. The traditional round navigation pad can be used to navigate through menus and options, in conjunction with the small button in the middle which activates whatever it is you've chosen. The four directions on the navigation pad also provide a quick way of setting the Display, Flash, the Exposure Compensation / Photo Creativity interface (dependent upon the current shooting mode) and Continuous Shooting/Timer options. The Photo Creativity options make it easier for beginners to change the colour, brightness, vividness and Picture effect modes, with changes previewed in real time on the LCD screen. The navigation pad also doubles up as a control ring that's used to set the aperture and shutter speed in the creative shooting modes, amongst other things. The ring is a little small, but it's not too over-sensitive and the ability to take full control of the RX100 V is very welcome. 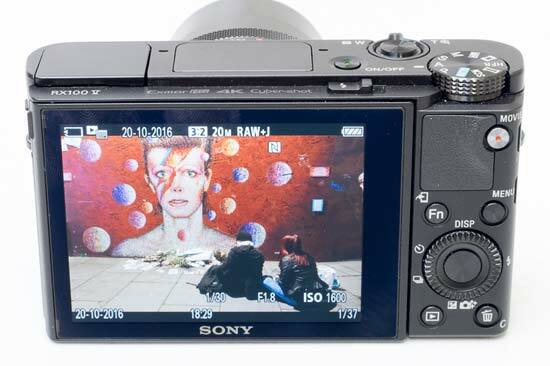 The Sony RX100 V can shoot full-resolution 20 megapixel images at 24fps for up to 150 JPEGs / 71 Raw images, an incredibly fast rate for a compact camera, especially as the 24fps rate is complete with AF/AE tracking. Combined with the very fast and accurate AF system, this makes the Sony Cyber-shot DSC-RX100 V the best compact camera that we've ever used for taking pictures of fast-moving subjects. The viewfinder blackout between shots has also been minimised when using the high-speed shooting mode, and siilent shooting is also available too. There's a small button for playing back your images underneath the navigation pad. Users have the ability to dip in and out of created folders of images or the calendar view, view thumbnails, select slideshows and choose transitional effects and accompanying music, or delete shots. Press the shutter button halfway and you're helpfully catapulted back into capture mode. And that's basically it. With a press of the Menu button in playback, users have access to a few in-camera retouching effects, including the ability to crop and sharpen an image and apply red-eye correction. Completing the rear of the RX100 V is the Custom button, which as the name suggests can be customised to quickly access one of over 40 settings. The bottom of the Sony RX100 V features a standard metal screw thread for attaching it to a tripod. A lockable plastic cover protects the lithium-ion battery, good for 220 shots or 110 mins AVCHD video, and the removable memory card, with the RX100 V supporting the SD / SDHC / SDXC format in addition to Sony's own proprietary Pro Duo Memory Stick format. The right side of the RX100 V has a tiny metal eyelet for the supplied wrist strap and also the Multi Terminal and HDMI ports underneath sturdy plastic covers, with another wrist strap eyelet on the left side. Note that the camera battery is charged via the USB port, rather than a more convenient separate charger, so it's a good idea to invest in an extra battery or two for a full day's shooting.